When I need to write IPA in Firefox, I normally use the transliterator add-on (https://addons.mozilla.org/en-US/firefox/addon/883). It knows X-SAMPA and the Kirshenbaum notation known from Usenet. I thought I'd found the link through you, but perhaps not. It has the full complement of characters and diacritics. Of course I only use a /ə/ and a /ɛ/ once in a blue moon. Wow. Thank you so much for creating such a well-organized Unicode page. It has been so helpful to me. I was a linguistics minor when studying for my undergrad but am now a Spanish graduate student and your page has helped a ton while transcribing medieval Spanish literature for my History of the Spanish Language class! Much better than hunting for the symbol. I use free GNU Emacs editor which come with its own ipa, ipa-kirshenbaum, and ipa-x-sampa input methods. Hi. I'm looking for a translator to IPA symbols to words.. As if I want to write : xeʔuˈɓü and the translator will be found the sentence that means.. If you mean translation software, I'm afraid that's a theoretical impossibility — for most languages. For French, for example, the sound transcribed in IPA as a may represent the verb forms a or as or the preposition à or even the interjection ha!. For English, the problems are considerably harder. It would be easier to use text-to-speech software. As French speaker, you would know which word the sound a was most likely to represent in the text that is being read. 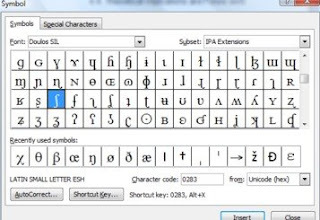 The problem is that few if any text-to-speech programs have been developed that can read IPA symbols. If the text to be read is in a language that you don't know, I think it's hopeless. You may find a program that can turn xeʔuˈɓü into speech sounds, but then you'll have to find a human being who recognises the language and the word/sentence. In any case, if you don't understand the symbols, you'll probably make mistakes when you type them in. On the whole, it will be quicker and easier to learn IPA. A simple tool which might help you is this web page. If it works on your computer system, you can click on the symbols one by one and hear how each one sounds.